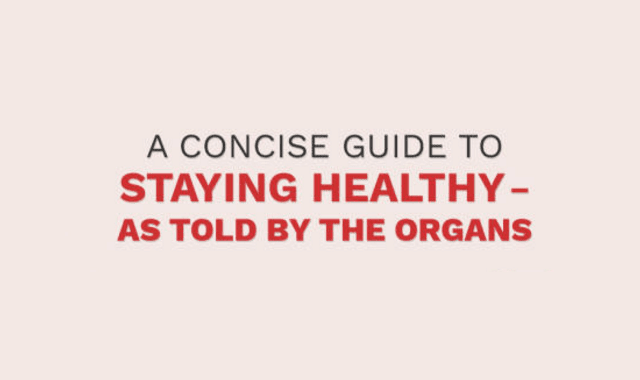 A Concise Guide to Staying Healthy – as Told by the Organs #Infographic ~ Visualistan '+g+"
You must be aware that your habit of munching on sweet and fatty midnight snacks is causing a lot of health issues, weight gain not being the least of them. A small study that was published in 2013 says that our biological evolution may also have a role in making us hungry before bed time. Our primal ancestors often went hungry through the day because finding food was not easy. By the time day progressed into night, they would do what was the smartest thing to do – eat what they had hunted or foraged during the day. The food was slowly digested and helped them wake up feeling less hungry. There was no need to immediately replenish calories in the morning and they could effectively begin their search for food again. Hormones like cortisol and adrenaline play a very important role in keeping us energetic, attentive and alert. But towards the end of the day, their levels fall, and we begin to feel lethargic. This is how our body prepares us for sleep. But, we have deadlines to finish and parties to attend. To pump up the energy levels, we either rush to the vending machine or rely on high-calorie snacks. Fatty and sugary snacks and drinks increase insulin level in your body and set you up for further hunger pangs and binge eating later at night. Junk food also affects your heart and other vital organs. Weight gain, insulin resistance, increased vulnerability to type-2 diabetes and high levels of bad cholesterol are just some of the adverse effects of unhealthy midnight eating habits. Here is what your vital organs have to say about all this.